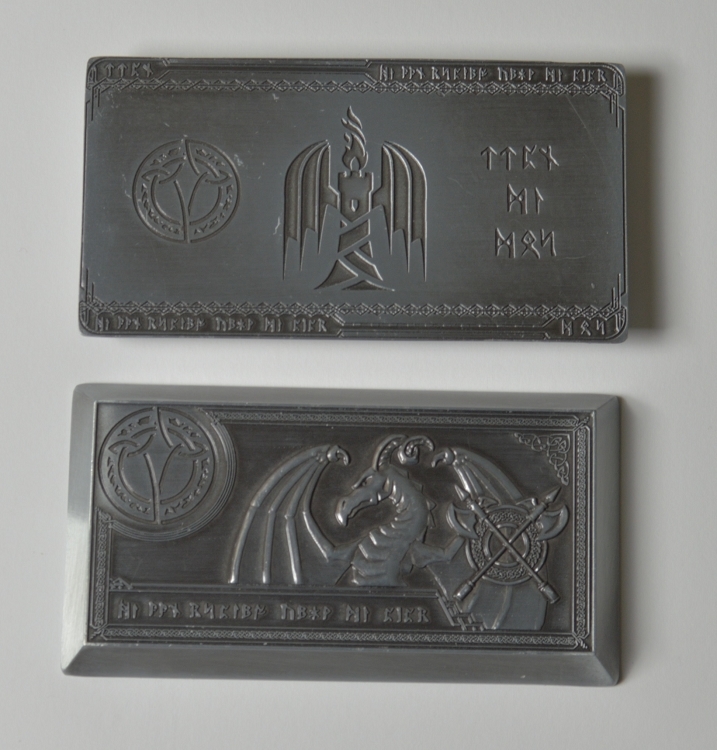 Made to compliment the Fire set as a very high value piece, this bar weighs 10 ounces! The front of the bar has raised designs while the back is recessed. Antique finish means blackened surface with buff marks to simulate wear like a real bar might have. This is my first time buying a bar from Fantasy Coin. I was super happy when I received it in the mail! It feels great, looks great, and has the wonderful design by Fantasy Coin! No complaints from me! Totally amazing product! I was speechless upon recieving it. It is SO HEAVY! I lost a bar on my hardwood floor, and it left a dent :D Pity for my floor, but wow does it add to the immersion of this being a truly valuable piece of loot! You won't regret getting this product!